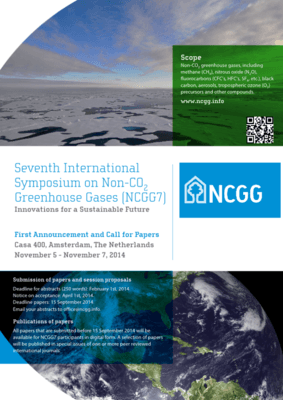 Theme 1, is the overarching theme of NCGG7 and aims at the integration and innovation. We seek for integration of innovative studies of sources of non-CO2 greenhouse gases, their effects and strategies to reduce these effects. This theme reflects in fact the overall aim of the conference: to synthesize new knowledge on non-CO2 greenhouse gases, in order to come to more effective solutions. Theme 1 includes contributions from Integrated Assessment studies, multi-and interdisciplinary approaches as well as transdisciplinary sciences. We particularly welcome contributions from the science-policy interface, and on corporate responsibility. Theme 2 will concentrate on sources, sinks and inventories, including innovations in emissions monitoring and reporting and verification of emission data. Papers presented in this theme will mostly be from the natural and technology sciences, although we also welcome contributions from integrated studies under this theme. Theme 3 will concentrate on atmospheric processes, and in particular on the physics and chemistry related to the radiative aspects of the atmosphere, including monitoring of concentrations of non-CO2 greenhouse gases, atmospheric processes including the relations between greenhouse gases and other air pollutants (e.g. aerosols). Contributions to this theme may include innovations in models and in atmospheric measurements. Theme 4, will concentrate on policy implementation, including mitigation and adaptation. 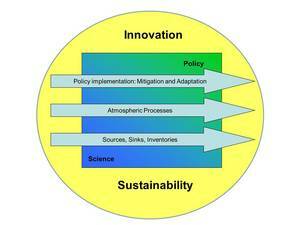 Policy and implementation issues may include assessments of implementation programs for reduction of non-CO2 greenhouse gas emissions and innovative approaches in policy implementations. Contributions within this theme will be from both natural sciences (e.g. reporting on new emission reduction technologies) and social sciences (e.g. on the economic or institutional feasibility of environmental measures). Contributions on technological issues and industries’ perspectives are welcomed, as well as discussions on the realization of policies.